Midou Sayaka - Mankitsu Happenning. Sirena Lovemore - SG lovemore. 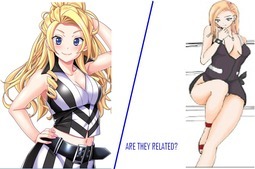 Are the related? close? inspired? anything? Keiryu Highly doubt it. Mostly because of the release date of Mankitsu Happening which if i recall was in 2015.